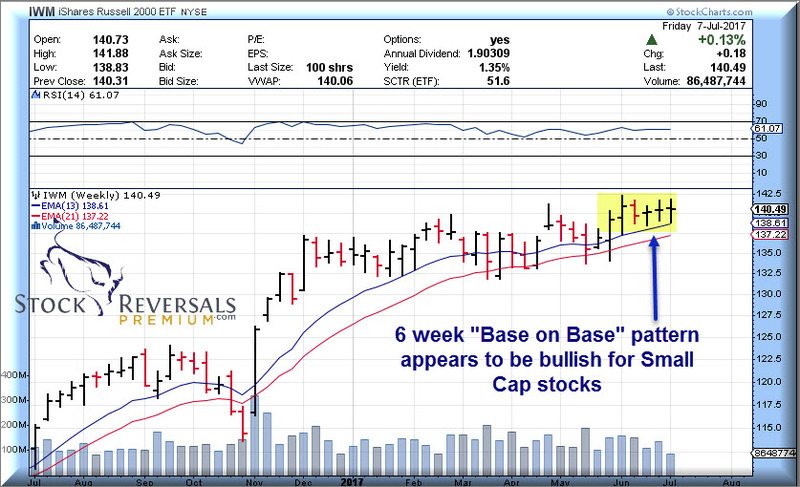 Stock Reversals | Weekly Forecast and Trading Ideas- Major 3 ongoing? 10 Jul Weekly Forecast and Trading Ideas- Major 3 ongoing? Intermediate 5 of Major Wave 3 ongoing? Obviously we had some turmoil as the 2nd quarter winded down as we advised our SRP members was likely. Although the SP 500 Index dipped further than we would have liked, it has managed to hold a key weekly support line near 2405 on a possible double bottom this past week. Its common for the end of a quarter to have a higher than usual amount of volatility as money managers are maneuvering their portfolios to lock down gains and also sell losers at the same time. Therefore we try to not to confuse a typical wave pattern or forecast with a brief period of typical volatile trade. As we started the 3rd quarter we advised our Members that we were taking the week off to relax and that the market may not show its hand until the 2nd week of July so here we are. 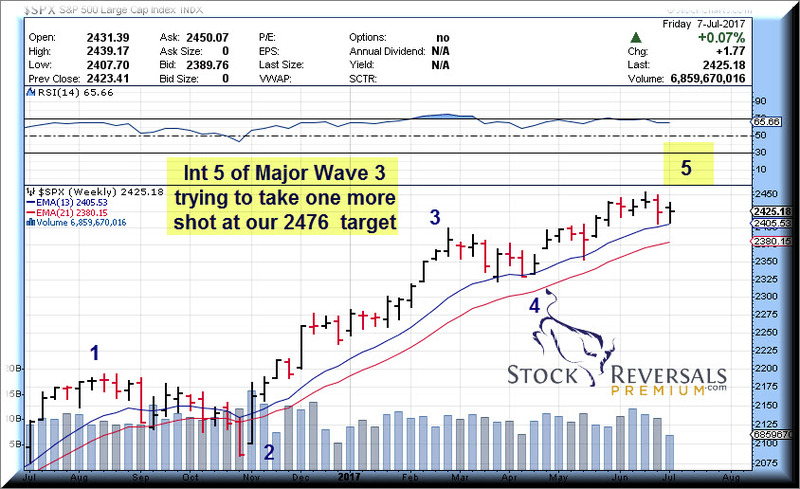 The assessment is that we are still in Major Wave 3 up from 1991 on the SP 500 and the high end targets we have had were 2443 and 2476 with an outside shot at 2525. So far we obviously took out the 2443 pivot but 2476 remains on tap as possible. The Tech sector has actually been going through a pretty normal ABC type correction after a torrid move up in the QQQ ETF from Election time into early June, it could be ready to resume the advance. 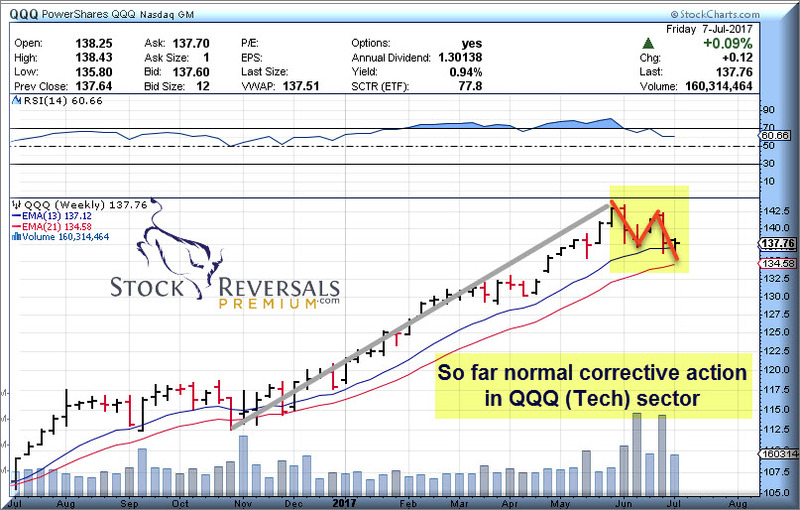 QQQ chart shows ABC pattern which for now looks corrective in nature. 132-134 would be support. The small cap sector has been in a multi month base pattern after exploding upwards out of the November 2016 US Election, this may be poised to take over leadership along with Biotech. 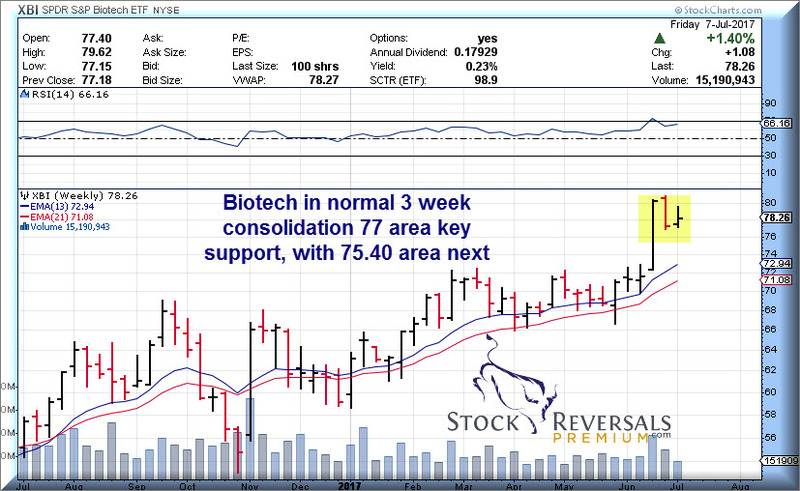 Biotech in a normal 3 week consolidation, showing leadership on a relative basis. 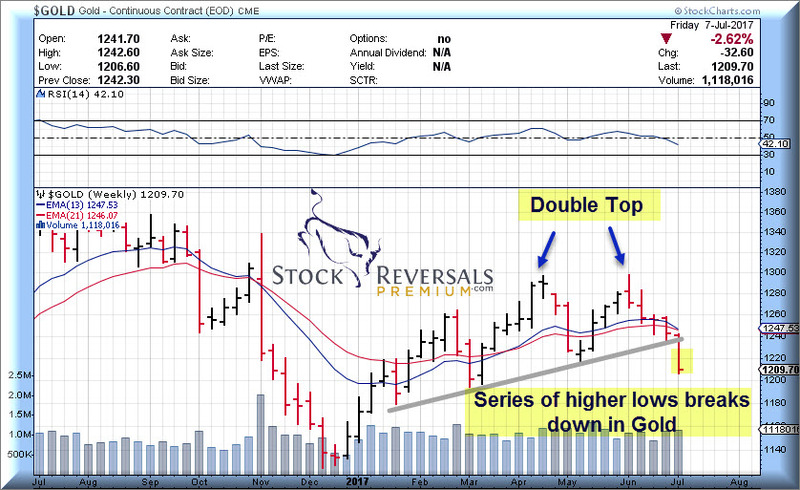 Gold has broken the series of higher lows and now is difficult to assess from here. We have stayed out of this sector for many weeks at SRP on purpose. “When in doubt stay out”. Take a moment to Opt In for our Free Stock research and Market Forecasts here: Name and E-mail only, and we do not share your information with any other entity. LITE- 7 week base pattern, Optical Communications. Popped back up last week. SRP Swing Trade and Forecast Alert Service: Read up and join today – See what our customers are saying, our full track record, sample alerts and reports and more. The past few weeks we closed out LABU for 19% gains, TWLO for 17% gains, and took profits on BIVV for 14% Gains just naming a few!